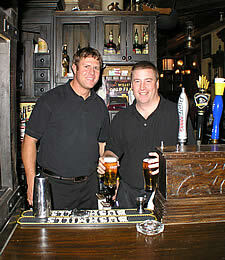 Brian and Brendan will play tonight at Fadó Irish Pub in LODO from 6 pm to 9 pm. We will be opening for Chilli Willi, a cover band that will start at 10 pm. Here's your perfect chance to come out and enjoy some great Irish music EARLY on a Wednesday night and find out what you've been missing! We'll pack in all of your favorite songs in those three hours. 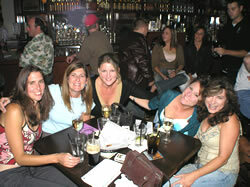 We have a lot of fun at Fadó on Wednesday nights (see some photos at left) and would like you to join us. We'll pick out three people who haven't come to Fadó to see us yet and offer them a free pint of Guinness Stout® or a Jameson Twelve® Irish Whiskey ! Note that Brian won't be at Jack Quinn's on Thanksgiving. He'll return the following Thursday night, December 1st. Our best wishes to everyone for a very Happy Thanksgiving, particularly all of our friends in the Armed Forces serving in Iraq, Afghanistan, South Korea, Germany, Kosovo and throughout the US and World. May you be safe wherever you are on this Thanksgiving Day and until you return home. Brian will play this Saturday (and most Saturdays) at the Irish Snug at 1201 East Colfax on Capitol Hill in Denver. We've seen some great nights with long-time fans Joe and Brian from Colorado College and Quinn's joining us two weeks ago, and a great group of young ladies from Sligo just last Saturday night. It's on East Colfax, it's wild and it's Saturday Night! The Denver Metro area has added no less than six new Irish Pubs in the past eighteen months. There are new Pubs in the Stapleton (Casey's) and Highlands Ranch (The Landsdown Arms) areas, LODO (Scruffy Murphy's) and a just-announced large Pub in Castle Rock (Brannigan's) as well as two on South Broadway (The Irish Rover and The Dubliner). These are all wonderful pubs, owned or staffed by some good friends. Because of our work schedules, we're not able to play in all of the pubs--certainly not on a regular basis, but look for us to appear in a few of them for special upcoming occasions. We'll keep you posted on the web site calendar, home page and this newsletter. In the meantime, be sure to support the great pubs of Colorado that have established and supported their great forums of Irish Pub Music every week. There's a new feature with the newsletter! You can now click on any of the photos in the newsreel at left to see a pop-up large version of them. You can submit your own photos to us, as well. Be sure to give us pictures at least 800x600 for editing. You can also view the entire newsletter online by going here. When you do so, the pop-up display window for the enlarged photos will be 800x600 only. Enjoy the pictures, and we hope to see you soon!